A group of up-and-coming but dysfunctional assassins attempt the advance their careers by attempting to murder Gunther (Arnold Schwarzenegger), the most infamous hitman of all time in this hilarious cat and mouse comedy of would-be killers. Download Killing Gunther in Digital HD from the iTunes store. Killing Gunther images are © Saban Films. All Rights Reserved. Killing Gunther. Is it an action film, is it a comedy, is it the latest film to showcase the amazing talent of Arnold Schwarzenegger? Unfortunately, it is none of these things. So what exactly is Killing Gunther? In short, the movie is a "mockumentary" told through the eyes of the world of contract killers as they band together to track down and kill one of their own, Robert 'Gunther' Bendik (Arnold Schwarzenegger, Terminator). However, these contract killers, are not the "brightest tools in the shed" and are constantly having a comedy of errors while on the pursuit for Gunther which includes some injuries and deaths along the way. 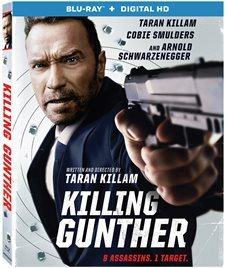 Killing Gunther is written by, directed by, and stars Saturday Night Live veteran, Taran Killam (How I Met Your Mother). While Killam's style and sense of humor normally will have you rolling on the floor, he, unfortunately, missed the mark with this film. The writing is a bit rushed, with most jokes falling flat, and by the end of the film, you are begging for someone to just kill his character. Aside from himself and Schwarzenegger, Killam's wife Cobie Smulders (Avengers) adds to the star power draw for Killing Gunther. Just like Schwarzenegger, Smulders talents are underutilized and wasted on this endeavor. Rounding out the cast of contract killers are Hannah Simone (New Girl) and Bobby Moynihan (Saturday Night Live) who add to the long list of "groan-worthy" performances displayed in the film. While being billed as an Arnold Schwarzenegger vehicle from all the advertisement literature, Killing Gunther is the exact opposite of that. Clocking in at a mere 93 minutes, Schwarzenegger is only in the film for the last ten minutes or so. The actual 83 minutes of buildup to his appearance in the film will actually test your patience and your stamina on watching this film like a badge of honor as you wait for the greatest action star of all time to finally appear. Killing Gunther is presented in 1080p AVC with a 1.85:1 aspect ratio. There are no signs of artifcating and the colors are natural. Since the film is shot in "documentary style" there is some slight color grading issues, however, this grading holds true to the more personal "mockumentary" filming used throughout the movie. While the video is stylized to be "prosumer' in quality, the audio is a bit more normal on what you would find in a typical action film. Presented in DTS-HD Master Audio 5.1. dialogue is all relegated to the center channel, while the machine guns and special effects are presented throughout the rest of the channels. Aside from the now common Digital HD copy on most Blu-ray releases Killing Gunther sports a very minute amount of special features. These include approximately five minutes of bloopers and two deleted scenes. 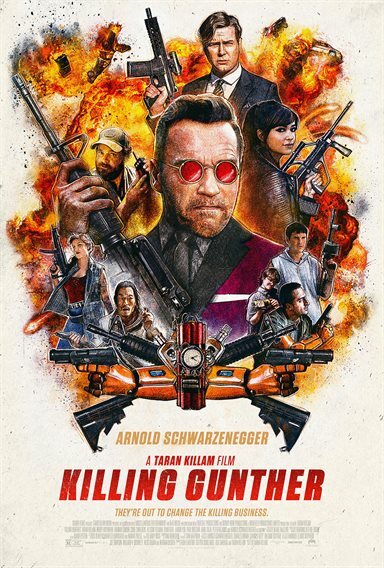 On its shiny surface Killing Gunther looks like a comedy-action film, starring the Terminator himself, Arnold Schwarzenegger, unfortunately, the only thing this film has going for Arnold is that he is absent for so long you truly appreciate his charisma once he does finally show up. You also get a sense of what he brings to all those other movies he stars in and why they are so successful. One can only hope this film does not follow the Arnold Schwarzenegger playbook and produces an equally groan-worthy sequel.